This is a strip map. Field boundaries are recorded and shading gives an impression of the undulating landscape. There was no standardised method for recording relief before the adoption of contour lines in 1839-40, but many draughtsmen used shading and brushwork interlining to some degree prior to this. 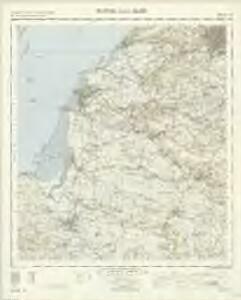 Major roads are coloured yellow/buff, conforming to military cartographic convention. The Sedge Drain is represented by a long, angular blue line crossing the relatively flat land in the centre of the map. A small section of road marked W. Lyng appears outside the main drawing and may have been used by the surveyor as an orientation station. The small hill marked with a red cross adjacent to Borough Chapel may also have been an observation point.